Social Media is now indispensable for every internet user. Everyone wants to get a share of this pastry. As we looked at the market competition with Google+, Microsoft is missing. It's finally coming. Unable to stop Windows Live from losing power, Microsoft is now rolling out a new social network called So.cl, which has been working on it for a long time. The site is currently integrated with Facebook. It basically defines Microsoft So.cl as a way of combining social networking and search to help students find and share web pages that they can work on and share. 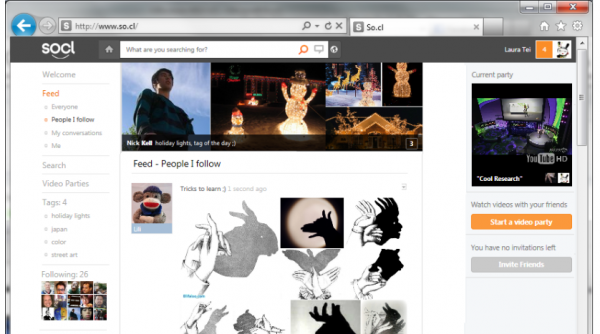 So.cl is actually a site where you use Bing search engine to share links with people who follow you. There are many similarities with Google Plus. The Video Partition feature will also perform the same function as Google hangout. Personally, I do not give a chance to So.cl this is in the market. If I do not work with Microsoft's other services, then I do not think it will be able to show it.